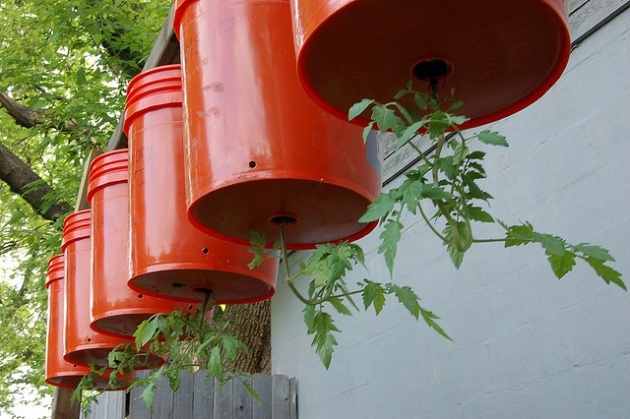 Upside-down planters have become a popular method of growing tomatoes to take advantage of vertical gardening by saving space in small yards or balconies. Upside down planters can be can be hung in balconies, from fences or railings, off porches, and in car ports and can be moved easily. Upside down planters eliminate the need for staking, reduce soil-borne problems and weeds and are less work to set up than staking tomatoes. Growing tomatoes (and other vegetables) upside-down is an easy and affordable project, so try it out! Make sure you hang it from a place which can support at least 50 pounds, as these planters can get heavy in a rainfall. Remember to water daily and fertilize often, as nutrients run out with the draining soil. Don`t forget to place a drip tray underneath to reduce water leaking below on neighbours (if on a balcony) and to reduce messiness. Tomatoes aren’t the only thing you can grow upside down! Peppers do well upside down, as do cucumbers, squash, strawberries, grapes, zucchini, eggplants and some beans. Plant marigolds as a companion plant in the top, as well as herbs! Decorate with fabric or patterned plastic to jazz it up. If you are using a bucket for growing tomatoes upside down, cut a hole about 3-4” in diameter in the bottom of the bucket. For other plants, remove most excess soil from around the root system and roughly measure a hole about the size of your root ball. Next, select the plants that will become your upside down tomatoes. The tomato seedlings should be sturdy and healthy. Tomato plants that produce smaller sized tomatoes, such as cherry tomatoes or roma tomatoes, will perform better in the upside down planter, but you can experiment with larger sizes as well. Push the root ball of the tomato plant through the hole in the bottom of the upside down container. After the root ball is through, wrap stem in cheesecloth, newspaper, screen or geotextile to help hold plant in place. Fill the upside down planter with damp potting soil. Do not use dirt from your yard or garden, as this will be too heavy for the roots of the upside down tomato plant to grow in. Also, make sure that the potting soil is moistened before you put it in the upside down planter. If it is not, you may have a hard time getting water all the way through the potting soil to the plants roots in the future as very dry potting soil will actually repel water. At this point you can add other plants in the top of the upside down container. Hang your upside down tomatoes in a spot where they will get 6 or more hours of sun a day. Water your upside down tomato plants at least once a day, and twice a day if temperatures go above 30 degrees Celsius.